This Tamaris sling pump radiates stylistic assurance and trendiness. The elegant, pointed form and medium-height funnel heel make it great for the everyday life. Comes in classic colours and a lacquer look, or a stylish metallic look - the shoes will look great with every outfit. They go great with jeans and add a stylish accent. Thanks to the comfortable Touch-It footbed, it looks great with a cocktail dress and gets you through the night. 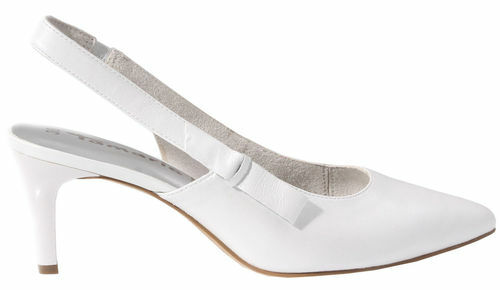 This Tamaris pump is perfect for every fashionista and is a real allrounder in every wardrobe. Clean: Use a cloth to remove the coarse dirt from your shoes. Care: Apply a colourless all-in-one cleansing mousse or cleansing gel to get your shoes looking particularly pristine. Do not use products based on wax complexes! Polish/protect: For the final touch: use a cloth to polish your shoes. Depending on what you would like to achieve (clean, care, polish or protect), you will find perfectly designed products for synthetic outer material in the Tamaris care series.